This bowl was primarily made by Lucas with assistance from Tim. He calls it "Lines of Art" because of the two lines they burned on the top using Copper wire. 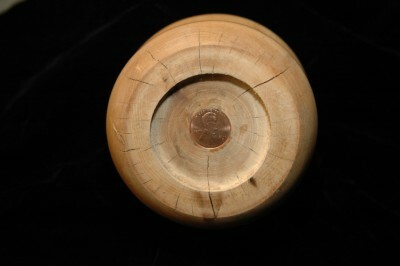 Lucas made this bowl just before his 7th birthday, and he embedded a 2009 penny on the bottom just like Tim does in some of his projects. 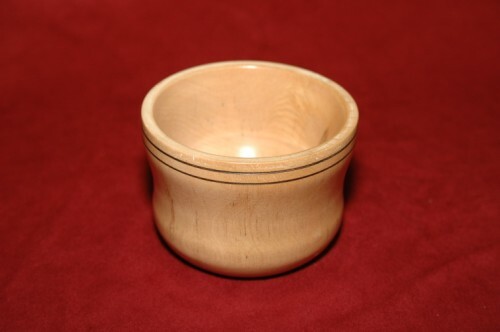 On the bottom of this bowl you can see some small cracks as a sign that he is still learning the turning skills and wood behaviors (see photo below). The apple wood came from a tree that fell down in a friend's yard this year.